Congratulations on the new addition to your family. A new kitten brings a lot of fun to a household. Here is some information on how to care for your new kitten. If you have any other questions please don’t hesitate to call us. Cats can be infected with roundworm, hookworm, and tapeworm. Large worm burdens can make your kitten very ill. They can also infect people. When you first obtain your new kitten he/she should be wormed immediately and then again ONE week later. Your kitten should then be wormed every 2 weeks until it is 12 weeks old and then monthly until it is 6 months old. Intestinal worms are rarely a problem in adult cats. The recommendation is to worm adult cats every 3 months. Products such as Milbemax tablets, Revolution topspot and Profender topspot are all effective against all worm types. Feline panleukopenia virus – causes fatal enteritis. It is spread by contact with infected faeces, nasal secretion and oral secretions. It can also be transmitted to a kitten during pregnancy. Feline rhinotracheitis – this is a herpes virus that causes upper respiratory tract disease in cats. It can also cause abortion and chronic (life-long) conjunctivitis and “dry-eye” (a lack of tear production). It is spread by contact with infected nasal and oral secretions. It can also be transmitted to a kitten during pregnancy. Feline Calcivirus – a flu-like virus that causes sneezing, runny eyes, mouth ulcers, loss of appetite, lethargy, high temperatures and joint pain. It can progress to pneumonia. It is spread via oral and nasal secretions. Feline Chylamidia virus – a flu-like virus that causes conjunctivitis. It can also, less commonly, cause pneumonia, abortion, stillbirths and infertility. It is spread by contact with infected nasal and oral secretions. It can also be transmitted to a kitten during pregnancy. You can also have your kitten vaccinated against feline leukemia virus. This disease is extremely rare in Australia, in addition the available vaccines do not have high success rates. Therefore we do not routinely vaccinate against it. 95% of fleas live in the environment, not on your cat. Therefore if you only treat your cat for fleas, it will soon pick up more. Fleas can cause disease and are a serious annoyance to your cat. Some cats are allergic to flea saliva so even one bite will cause them to itch intensely. The easiest way to control fleas on your cat is with a topspot preparation. e.g advantage or frontline This can be applied to the back of the neck every month. If your cat is bathed regularly, it may not last as long. All animals in the house should be treated for fleas. In addition you will need to regularly treat your cat’s environment. This means regularly washing your cats bed and flea bombing your house (especially if you have carpet) periodically. Ticks are a serious problem in this part of Sydney. They cause loss of appetite, vomiting, difficulty breathing and paralysis starting in the hindlegs. Whilst you can use Frontline to minimize the risk of tick paralysis, nothing is 100% and your kitten still needs to be checked daily for ticks. If you find a tick it is best to remove it straight away, or bring it straight to the vet to have it removed. If the head is left in, it may create a small raised itchy lump but will not continue to poison the cat. If your cat is showing no signs of toxicity it should still be watched carefully for the next 24 hours as the toxin will continue to affect them. Frontline spray needs to be applied every 3 weeks for prevention of ticks. It should not be applied within 2 days of washing your cat, as it requires some oil in the coat to bind to. Cats are naturally clean animals so toilet training is generally not difficult. It is important to keep your kitten’s litter tray clean, emptying it of soiled litter. It should not be kept next to their food bowl, as this will discourage them from using it. If you catch your kitten in the act of going to the toilet elsewhere in the house, pick it up telling it no and place it in its litter tray. If you don’t catch your kitten in the act it will not understand what it is being punished for. Be sure to check what you are cleaning up “accidents” with. Some cleaning products contain ammonia compounds; these smell like urine to your cat and will encourage it to keep messing in the house. Kittens are playful animals. Be sure to give your new kitten toys to play with. “Catnip” toys are especially good as kittens love the smell of them. They also like moving toys and bells. Another good toy for your kitten in the house is a scratching post. 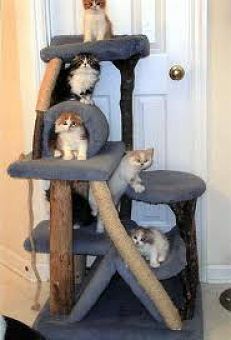 Just as with toilet training, if you catch your cat scratching at furniture, carpets or curtains in the house, pick him up, telling him no and place him on his scratching post. They quickly learn to scratch only on their post when in the house. Hunting is a natural instinct for cats. They will hunt regardless of their need for food. Most cats hunt at night, therefore keep your new kitten inside between dusk and dawn. It is also a good idea to place a bell (or several!) on your cat’s collar. Desexing is routinely performed at 6 months of age. Undesexed cats tend to wander. Hence they are more often involved in cat fights and are more often hit by cars. Undesexed males also tend to urine spray. Desexing your cat also prevents unwanted litters being born and the potential for an increase in the feral cat population. Desexing minimizes the risk of female cats developing mammary cancer later in life. The surgery is routine and your cat stays in hospital for the day. Most cats show very little effect from desexing and are back to normal within 1-2 days. Kittens need to be fed a mixture of good quality dry food designed especially for kittens and some canned/wet food. These foods are usually called “growth”. 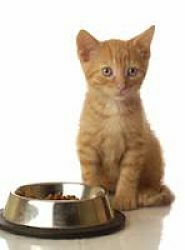 Kittens have different nutrient and energy requirements to adult cats so should not be fed adult foods. Avoid feeding dry foods only as this leads to obesity. The majority of cats are lactose intolerant, therefore dairy products will give them diarrhoea. Once weaned your kitten no longer requires milk in its diet. You can however give you cat lactose-free cat mild if you desire. Start offering your kitten RAW chicken necks and wings from an early age (approximately 8 weeks). This will help with teething, and, if eaten regularly for the rest of its life, keep your cats teeth clean. However, they must be introduced at an early age; otherwise your cat will refuse them. You can also start offering them other raw foods such as strips of beef/lamb or lamb cutlets. This may mean using the shower recess, laundry, patio or backyard as a feeding platform to avoid mess inside the house. Feeding raw foods as described above is VITAL to maintain healthy teeth and thereby limiting dental procedures throughout your cat’s life. It is also a much more natural way for your cat to eat and provides stimulation and enjoyment. Kittens are most often ad lib feeders, that is, they tend to graze, returning regularly to their food bowl throughout the day for one or two mouthfuls. If you wish to have set meal times for your cat start with three meals a day, reducing to two meals at approximately 4-6 months of age. 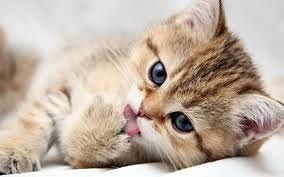 Young adult cats should be fed approximately half raw natural foods such as beef strips, chicken bones etc that need to be chewed to be ingested, and half tinned food. Try to phase out dry foods altogether at this stage. Avoid ad lib feeding dry food to adult cats as this tends to lead to obesity. Microchipping is now compulsory for all kittens. Microchipping enables vets to contact you if your cat is found or injured. The microchip is about the size of a grain of rice and is placed between the shoulder blades. It should be done before a kitten is sold (your new kitten should already be microchipped). You will need to register your kitten at your local council.